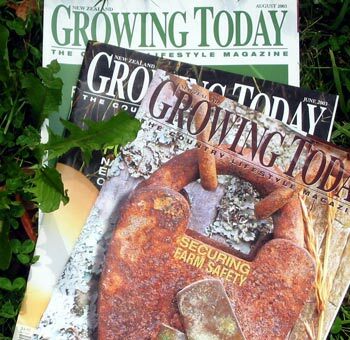 Growing Today is a New Zealand magazine with good articles and advice for small block farmers, who are often called 'lifestylers'. It's thoughtful and practical, and has a good honest attitude to the cost of farm developments. This magazine claims to give "good advice for country life", and it does just that. The articles are aimed at informing lifestyle block owners about types of crops to grow, ways to use the land, and so on. All sorts of farming possibilities are discussed. Good links are also provided to specialist resources, should you want further information. It's a very good read for New Zealand hobby farmers. Each month there is a really great selection of articles to read. Some topics are practical and sensible, while others can be the start of a horticultural dream.